Depression-Era Scrip Stamps? It’s a mystery! 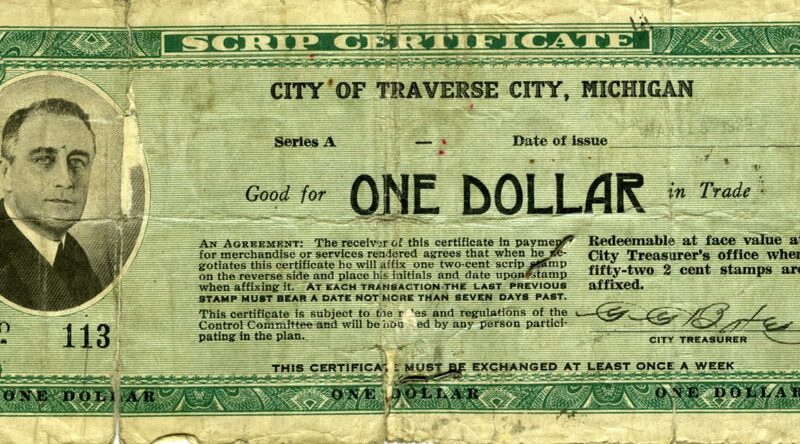 For this month’s Mystery Photo, we show you two sides of scrip, a currency Traverse City city leaders issued in 1934, the height of the Great Depression. This money could be redeemed at many Traverse City businesses in exchange for goods. At one point teachers were paid in scrip since there was no other money available to them. The question is—why is the back filled with stamps? What goal did that accomplish? Good luck, history buffs! Previous Post50 Years Ago: News from January 1968 (Part II)Next PostFactory On Boardman Lake identified! So, if you had a $1 scrip and only needed to spend 50c. The back would have stamps equivalent to your change? so the next time the scrip was used it would only be worth 50c not the full $1 until all the change was used up indicated by the stamp over the amount. So are we, K! Stay tuned! The answer is demurrage. Essentially the note would lose value at a set rate so if you hoarded it, it would eventually be worth nothing. So you have incentive to spend it so you’re not the guy holding the note when the rate kicks in and you need to buy the stamp to restore the value. I believe the notes would expire. They had to receive stamps on the back on a weekly basis from participating merchants. Then the scrip could be redeemed for one American dollar. Who paid? Ultimately, the merchants.